I book a limited number of private commissions each year so I can keep my full focus on each and every client. I work with dog photography clients in San Francisco, Santa Fe and beyond. Visit my Travel Schedule to see when I'll be in your city. Before I meet your dog, I want to get to you know you, your values and your lifestyle. Our first step is the Creative Call where we'll talk about your project, who’ll be in the photos, and where we’ll be photographing. Of course, we’ll also talk about your dog—I want to understand the essence of who he is, what your relationship is like, and how your life has changed since bringing him home. Photography Sessions always happen in a place where you’re both comfortable, whether that's lounging in the sun spot at home or out on your favorite weekend hike. The location is completely up to you, and there is never a time limit. I want our time together to feel like any other day you’d spend with your dog—easy, joyful and connected. Then, before I begin production, I’ll help you get to the heart of your story with a Presentation. I’ll walk you through the process of curating a collection of inspired, archival-quality prints for your home and together we’ll select images that best reflect you, your dog and your friendship. It's not uncommon for my clients to feel emotional during this process–relief, joy, sadness, and more joy. These photographs will not only last forever, they will tell your story, and as an artist there is nothing I love doing more. I love the warmth and timelessness that black and white photography naturally lends itself to. It cuts to the heart of the matter, and tells an honest story. It’s incredibly important to me to deliver work that’s not only original, but long-lasting; there’s no such thing as an unimportant detail when it comes to production which is why I produce all my photographs by hand in my studio. 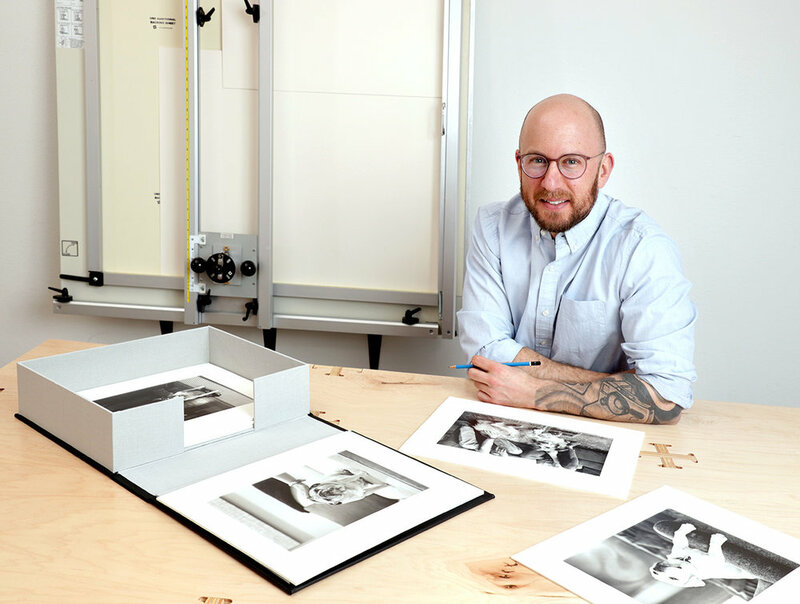 The photographic images you’ll receive are printed on the highest-quality fiber based papers, then matted to archival standards and handled with the utmost care so they’ll last for generations. After I hand-cut each custom mat, prints are signed and numbered in a limited edition of two–the first print goes to you, the second goes to the studio. Production starts and ends with me, so you can have confidence that the work you are investing in is not only of the highest quality, but that I've poured myself into every single piece that leaves my studio. I wouldn't have it any other way. These are one-of-a-kind pieces of art that are moving, historic and yours alone. You simply won't find this level of care anywhere else in the industry. Matting and signing prints in the production room. In this overwhelming digital world, it's the cherished objects we keep that define us. A professionally printed black and white photograph carries a physical and metaphysical weight, which for me, is truly intoxicating. It becomes a family heirloom, a beloved art object that is valued and talked about at dinner parties, allowing the best memories of your companion to live forever. This is why I produce all my art prints by hand at my studio — to make sure your memories are treated properly. This is why print matters. Though my studio is in Santa Fe, I regularly work with dog photography clients in San Francisco as well. Each Bay Area trip has a limited number of spots that book quickly, which is why I encourage planning ahead so that you can have the most scheduling options possible. I travel outside of Santa Fe and San Francisco on request, so please don't hesitate to get in touch. Can't wait to see you soon! My photography studio and home are in Santa Fe, New Mexico. I schedule Santa Fe dog photography sessions with open availability, as well as host Sunday Open Studio Hours from 11:30am - 2:30pm (just about) every Sunday at 1708 Lena St #202, Santa Fe NM 87505. Come on by and say hello. A pet photography gift certificate makes a deeply personal gift; it’s like inviting someone into a room in their own heart. Customizable gift certificates include a Photography Session, Presentation, and a hand-selected collection of prints in the perfect sizes. It’s an easy way to give something memorable, timeless and truly meaningful. Contact the studio now to start building your dog photography gift certificate.